Today Palestinians are called Palestinians because their homeland had been known as Palestine prior to 1948. The use of the name "Palestine" in English became common after the European Renaissance, and the name was officially revived and used again prior to and after World War I when the British took control of Palestine. In 1914, when the British military was planning to try to defeat and remove the Muslim Ottoman Empire’s forces from the region, two Russian Jewish Zionists initiated the idea of forming a European Jewish military unit that would be part of the effort. By 1915 the unit grew as Jews from Egypt joined in that effort. And Jewish Zionists around the world saw it as an opportunity to promote the idea of a modern Jewish State. Ironically, Arab Palestinians were instrumental in the war against the Ottomans, though unaware of the Zionist plan. The Arab Palestinian forces were organized by a British Army officer, T. E. Lawrence, better known as Lawrence of Arabia, renowned for his role during the Arab Revolt against Ottoman rule. The Arab Palestinians were very helpful in fighting against the Ottoman Turks, and in the Battle of Aqaba they were victorious over the Turkish defenders. By the time World War One ended in 1918, the Ottoman Turks were out of Palestine, in large part due to Arab efforts. In fact, commanding British General Allenby, who had taken Jerusalem, praised the chief Arab leader for his role in the victory over the Ottoman Turks. He wrote: "I send your Highness congratulations upon the great achievement of your gallant troops... Thanks to our combined efforts, the Ottoman army is everywhere in full retreat." The British then occupied Palestine until 1948. That, again, was when the new State of Israel was established with approval of the United Nations, and more than a million Palestinians (according to their account) were displaced and made refugees. Ever since then the dislocated Palestinian refugees have suffered in various ways, and many of the Palestinians who managed to keep their homes in Israel by becoming Israeli citizens say they don't have it too much better. They say they have been treated as second-class citizens in their own home land, and do not have rights equal to the Jewish Israelis. In fact, there has been a long history of dislocation, discrimination, oppression and persecution against Palestinians which goes back all the way to 1917. For many decades Palestinian land, communities and neighborhoods have been occupied and ruled by occupying Israeli military forces. Palestinians have been incarcerated, tortured, killed and assassinated. Israelis have destroyed Palestinian homes, orchards, and other property. Palestinians have had practically no say about it, no rights, and no legal recourse, which has inevitably provoked outrage. But Americans haven't heard much about why, until the atrocities became so blatant that they could no longer be ignored or denied. This has astounded many people in the world, considering that the history of the Jews is one of being the victims of persecution themselves, especially at the hands of the Nazis in Germany before and during World War II. Even Jews in America suffered persecution by Nazi sympathizers in America while Hitler was rising to power, and white American racists went to the extent of putting signs in their store fronts that said: "Niggers and Jews Not Allowed." Many American Jews found they had to change their last names to English-American-sounding names to avoid being discriminated against, and they did everything they could to be assimilated into American society. That is why it is so hypocritical of Israeli Zionists to be persecuting and oppressing Palestinians. But even though most Israeli Jews are good people, it shouldn't surprise us that some Jews who have been persecuted become persecutors. Many people who were persecuted become persecutors, and many do it justifying themselves with religion. Remember, one of America's greatest founding fathers, Benjamin Franklin, commented on that in an essay on "Toleration" in which he pointed out persecution of and by Christians. He wrote: "If we look back into history for the character of the present sects in Christianity, we shall find few that have not in their turns been persecutors, and complainers of persecution. The original Christians thought persecution extremely wrong in the Pagans, but practiced it on one another. The first Protestants of the Church of England blamed persecution in the Roman church, but practiced it upon the Puritans. [The Puritans] found it wrong in the Bishops of the Church of England, but fell into the same practice themselves in New England [in America]." Since 1948, hard-line Zionist Israeli Jews have also become persecutors. But, they justify themselves because they feel that any and all use of armed force, violence, death, destruction and even illegal covert operations and assassinations are justified and necessary to control Palestinians and exact revenge on those who have attacked or may have attacked or may attack Israelis. On the other hand, as Palestinians see it, the Israelis created the problem in the first place. And while Israelis claim to act only in "self-defense," that is not true. They have often over-reacted and gone way beyond "an eye for an eye" retaliation when attacked by those they have offended. They have resorted to offensive invasions and occupation, not only of Palestinian lands in Gaza and the West Bank, but also of their neighbor Lebanon, and they have destroyed much of Lebanon's infrastructure more than once. To the Israelis, a legitimate target is any location and any dwelling or any vehicle in any country that may contain a suspected terrorist. The Israeli government has acted as if any collateral damage or death of innocent men, women and children, and any destruction of homes and buildings and infrastructure, is a legitimate consequence of the "war on terrorism." But to Palestinians, Israelis are the terrorists. The Israelis feel it is their "God-given right," and they feel it is a fight that they must win at any cost. But, they misunderstand and distort prophecy to suit their own purposes. The idea of Jewish "return" (called Zionism) stems from a story about many of their distant Jewish ancestors being forced to leave their ancient homeland (Palestine) almost two thousand years ago in the great "Diaspora" (dispersion) beginning not long after the death of Jesus and following a crushing Roman response to a series of Jewish uprisings against Roman imperialism and occupation. The result was a defeat of the Jews and the destruction of their second temple in Jerusalem. That, so the story goes, was when many Jews were forced to leave the region and scatter to various European countries. However, most people do not know the full story, because the Jewish revolt never would have happened, and the Diaspora never would have happened, if the Jewish people had followed the teachings of the "House of Hillel" rather than of the "House of Shammai." The teachings of Hillel the Elder preceded those of Jesus but were similar in that they were based on peaceful coexistence and non-violence. (In fact, Hillel taught the Golden Rule before Jesus did.) But Shammai was a militant zealot and unfortunately appealed to Jewish pride, prejudice and emotions, and that caused the violence and the war, and ultimately the Jewish defeat and the Diaspora -- all because Jews ignored the teachings of Hillel and Jesus. Even so, some Israeli scholars have recently submitted that most Jews actually remained in the area, even though they were reduced to the status of a subject people in Palestine, which would be fought over and ruled in turn by the Romans, Byzantines, Persians, Arabs, Christian Crusaders, Ottoman Turks, and British. Historians tell us that the modern Zionist movement was initiated by German and Austrian Jews, some of whom were bankers, back in the 1800s. Some European Jews then immigrated to Palestine, and it increased in 1917 near the end of World War I. That's when it really began to negatively affect the Palestinians. In fact, that's when certain things happened that have bothered Palestinians ever since. Considering the historical facts and events, the Palestinians have felt betrayed, as has been mentioned, and they feel that the modern State of Israel is built upon a foundation that was undermined and damaged by the Israelis themselves. After all, the Jews in Palestine after 1920 did not honor the Balfour Declaration, and since 1948 the Israelis have not honored that declaration or subsequent declarations, or Geneva Conventions or resolutions by the United Nations --- such as U.N. Security Council in resolutions 446, 452, 465 and 471, made under Chapter VI of the United Nations Charter, and Article III of the Geneva Convention Relative to the Protection of Civilian Persons in Time of War, especially Article 3(1) and Article 3(2). As the Palestinians see it, the British takeover of Palestine was unfair. The Palestinians feel that the Balfour Declaration was unfair, and that the Israeli treatment of Palestinians was and has been in defiance and non-compliance with the one part of that declaration intended to protect Palestinian civil rights (as members of the British Parliament have recently admitted). They feel that the Israeli government has violated International laws, Geneva Conventions and U.N. Security Resolutions with impunity. And they feel that the ultimate unfairness has been the continual Jewish takeover and occupation of Palestinian homes and land. The Palestinians also feel they’ve been betrayed by the Americans, who have funded, supported, and armed the Israelis. That is a significant part of the reason for Palestinian resentment, discontent, and anger toward Israel, England, and the United States. That resentment is very understandable, especially when you consider the long range impact that British-Israeli-American actions have had on Palestinians. Their natural and justifiable claims to their homeland have been denied, and their plight has increased commensurate to the ever-increasing number of arriving Jewish immigrants ever since 1917. 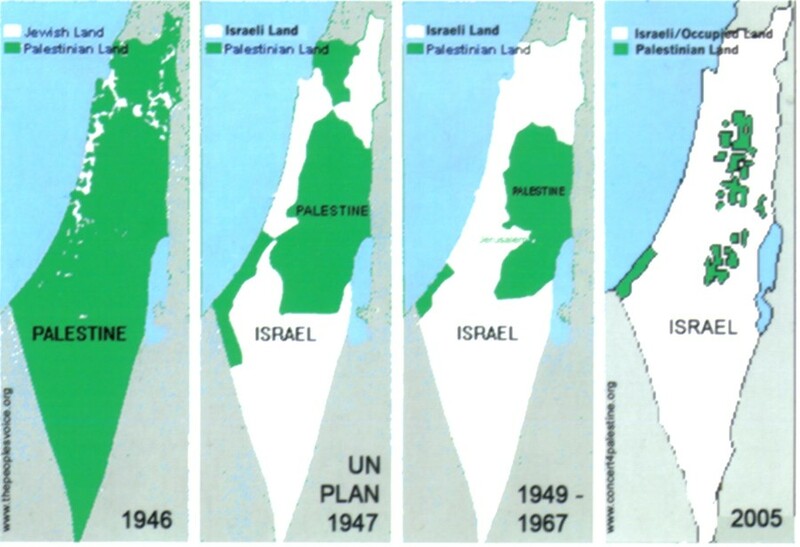 The situation became so bad that in 1947 the United Nations recommended partitioning Palestine into two separate states. That, however, triggered a civil war between the Palestinians and the Jews, and when the British finally withdrew in 1948 when the new State of Israel was established, the dispute was still unresolved and still raging. That war has been raging sporadically ever since 1948 when the new State of Israel was established. But all the battles have been won militarily by the Israelis, since they have been backed and supported by American wealth and armed with modern American weapons, including jet fighter planes, helicopter gun ships, and tanks. In fact, it is because of that American support and military capability that Israelis have been able to capture a lot more land and gain military control over the whole area. Many Americans have approved this all along, but there’s not much attention paid to why. In 1948 the justification was partly sympathy toward the Jews, but it was mainly to “contain the spread of Communism by the Soviet Union.” However, that’s long since been irrelevant. And that was an ostensible reason anyway. The real reason is that the "legal" establishment of the state of Israel is based on biblical grounds agreed upon by American Christian Zionists, and that violates the spirit and the letter of the First Amendment of the U.S. Constitution because it established law respecting the establishment of religion. That decision has proven to be extremely problematic, to say the least, and its consequences have been much conflict, violence, death, and destruction. More On The Rationale for the Idea of "Zionism"
Since 1947-48 in Palestine Zionist Jews have taken what they want by force and displaced Palestinian people native to the region. They have been an invading, occupying, military power, armed, supported and enabled by the British, the Americans, and the United Nations. And Israel’s iniquity has only gotten worse and worse because Zionists cling to erroneous, flawed logic based on a false interpretation of prophecies. The idea of "Zionism" has been brought into question not only by archeologists, but by scriptural and theological scholars. Moreover, the logic of the idea is simply out of touch with the reality of how the "legal ownership" of lands has been determined for a long time in all the other countries on earth. And the idea is fully debunked in the article on Zion vs. Zionism. Granted, it is true that ancient Jewish prophets did foresee a "return" of Jews from different places in the world to the land in and around Jerusalem. However, prophecies are open to interpretation, and should be understood with reason. And nothing written in scriptures justifies what Zionist Israeli Jews have done since 1947, depriving Palestinians of their right to their homes, their property, and the lives they would have lived had it not been for what the Israeli government has done. Furthermore, most of the descendants of ancient Jews stayed in the Middle East after the Diaspora, both in Palestine and in successful communities from Egypt to Iraq and Iran. And they really did not have many problems with regard to religion until after the State of Israel was founded in 1948, when the intrusion of European and American Jews into Islamic lands increased, and Arabs and Muslims began to object to that intrusion. Ironically, today even some hard line Jewish Zionists concede that the idea of a forced exile from the Jewish homeland is not generally accepted in serious Jewish historical discussions. But the preamble to the Israeli Declaration of Independence states: "After being forcibly exiled from their land, the people remained faithful to it throughout their Dispersion and never ceased to pray and hope for their return to it and for the restoration in it of their political freedom." That is why we should learn and understand the truth and reality about Jewish beliefs, because some of them may not be based on the real truth. And, even if they were and are, it does not automatically give Jews the right to do what they have done and are still doing that causes harm and loss to native, indigenous Palestinian peoples. We should also understand the truth about Islam, because Islam’s founder, Muhammad, said that Allah was the Arab name for Jehovah or Yahweh, the same God that Jews worship, and the same God that Christians should worship. Furthermore, the Hebrew Torah and Tanakh (Old Testament) does not indicate that returning Jews would or should take so much land away from native indigenous people who’s ancestors have lived there for thousands of years. But, the Torah and Tanach certainly does command the Jews to not kill, and not to covet that which belongs to your neighbor. It also says that pride goes before destruction and an arrogant spirit before a fall, and it is better to be of a humble spirit than to join the proud and militant in their aggressive and offensive pursuit of the "spoils" of war. All Jews and Christians should remember that, and so should Muslims, because they are all supposed to honor the good advice given in the Torah and Tanakh. We should also understand that there is another reason why the plight of the Palestinians has steadily worsened over time. Since the early eighties the population of right-wing Fundamentalist Orthodox Jews in Israel has grown considerably, and some of their leaders are as rigid, exclusive, intolerant, proud and militant as some of the leaders of the Christian Right in America who are also intolerant of and offensive toward Palestinians and Muslims in general. That has been very unfortunate because it is what has provoked terrorist activity toward Israel and the West, and it has betrayed those Jewish people in Israel who are peace-loving, good people. They are like the majority of Americans who recognize the value and necessity of a secular government and separation of church and state, and don't try to use their religion for political advantage or use the pulpit for partisan political grandstanding cloaked as "religious" righteousness and "law." Despite that, ultra-Orthodox Jews in Israel have been very aggressive and persistent in trying to impose a fundamentalist version of Judaism on most of the country, including forcing women to sit at the back of buses and driving secular Jews out of some neighborhoods. But, fortunately, it has recently become apparent that growing numbers of Jews for religious freedom (and freedom from Theocracy) have been challenging the power of the ultra-Orthodox Jews. Many good Israelis are as much against the militant Israeli hardliners as they are against the militant Palestinian hardliners. They are sick and tired of war, even though most of them are too young to remember how it all started. Some of them may not even be aware that the ongoing conflict between Israel and the Palestinians is simply a continuation of what began a very long time ago. A notable Israeli who is sick and tired of war is Mordechai Vanunu. He is a former Israeli nuclear technician who in 1986 revealed details of Israel's nuclear weapons program. For that he was drugged and kidnaped in England by Israeli intelligence operatives, taken to Israel and convicted in a trial held behind closed doors. He spent 18 years in prison, including more than 11 years in solitary confinement, during which he says he suffered "cruel and barbaric treatment." Even after he was finally released from his first prison stretch, Israelis put many restrictions on his speech and movement, and he has been put back in prison twice more recently for violating the absurdly strict terms of his parole. But, while the Government of Israel hates and persecutes him, peace activists the world over regard him as a hero for taking a stand against nuclear weapons proliferation, and Vanunu has been nominated for the Nobel Peace Prize many times. The world should be made aware of such aspects of Israeli offenses and Israeli "iniquity." For example, Israel adopted the practice of authorizing "targeted assassinations" and covert death squads a long time ago. It started following the 1972 Olympics in Munich – where those 11 Israeli athletes were killed by Palestinian guerillas who’s original intent was to bring attention to the plight of the Palestinians. At that time Israel decided to not even try to have the perpetrators and conspirators arrested and tried in courts. The Israeli government instead launched a systematic covert campaign of assassinations of those they judged as guilty for the Munich murders, and they managed to exact revenge no matter where the targets were in the world. Then they continued the practice of targeted assassinations, killing a broad range of Palestinians judged to be enemies of Israel. This has been kept secret from the general public until fairly recently, and while some Israelis feel the practice was and is justified, it ought to horrify everyone who values true justice and the rule of law. No government in the world should authorize assassinations (and that includes the U.S.). Unfortunately, it is still practiced by some governments, and the Israelis. In fact, the current conflict is continually escalated by retaliatory violence and killing. It's become difficult to keep track of the order, but Palestinian attacks or suicide bombings are always followed by Israeli attacks, invasions and incursions, and even by targeted assassinations and killing of Palestinians, many of which are done covertly. The Israelis under the leadership of Ariel Sharon and then Ehud Olmert and Benyamin Netanyahu have consistently and continually used a heavier hand (or iron fist), wielding disproportionate use of deadly force, thus pouring more fuel on the flames of conflict and ensured an increase in the cycle of retaliatory violence by widening the area of violence and destruction. The effect has been only to strengthen the resolve of Palestinian extremists like the leaders of Hezbollah and Hamas, and weaken and even negate the influence of Palestinian moderates. In 2000 George W. Bush gave Israel a clear signal approving more aggressive action. So, in September 2000, Israeli Ariel Sharon blatantly insulted Palestinians and provoked them, and that resulted in the Second Muslim Intifada (which means retaliatory war against oppressive persecution and military occupation). Some of the most major and blatant consequences of that renewed round of violence have been covered by the American news media, but certainly not enough. And, since Americans have not been very informed, they should know more about it, and more about some notable prior examples of Israeli offenses and atrocities. Back in 1953 an Israeli military unit led by Ariel Sharon was responsible for the mass slaughter of Palestinian refugee inhabitants of Qibya, a village in the then-Jordanian West Bank. In the war in 1967 Israel took even more land by force, and following that there was a particularly brutal enforcement of the Israeli occupation in Gaza, led by Sharon. In 1982, emboldened by the Reagan Administration and the American Christian Right, Sharon led an illegal military invasion and intrusion into Lebanon and was responsible for the massacre of many Palestinians, particularly in the Sabra and Shatila refugee camps in Beirut, Lebanon. These were war crimes that were ignored and allowed by the rest of the world. Palestinian suffering due to the abuse of Israeli military power then increased over the years, and it markedly increased due to Sharon's actions before and after he became Prime Minister of Israel. Then he was responsible for many more targeted assassinations of Palestinian leaders, and the bulldozing of thousands of Palestinian homes, orchards, and other property. To be fair, it should be noted that prior to that, back in June 1967, just a few hours after the Israeli military captured Jerusalem's Temple Mount, then Defense Minister Moshe Dayan visited the site and noticed that his troops had hung an Israeli flag on the top of the Al-Aqsa Muslim Shrine. Dayan told the soldiers to remove it, because he felt that it was a blatantly provocative act. Unfortunately, Ariel Sharon's highly publicized and very provocative act of visiting the Al-Aqsa compound in September 2000 was also blatantly provocative, and it was the final step in a process that ultimately negated Dayan's strategic legacy of trying to normalize the occupation by concealing Israel's presence. Even though Dayan had once said, "Don't rule them, let them lead their own lives," Sharon wanted to dominate and rule with an iron fist, and crush any resistance. Sharon not only provoked the second Muslim Intifada against Israel, he ended the peace efforts made by all the peacemakers of the world. And since then the Israeli government has defiantly displayed their flag anywhere possible, as if thumbing their nose at Palestinians. And their tactics of enforcing the occupation got meaner, more destructive, and more deadly. For example, back during the first two decades following the 1967 War, an estimated 650 Palestinians were killed in the West Bank and Gaza Strip. But, during the six-year period between 2001 and 2007, Israel killed more than 650 Palestinians per year. Moreover, during the first three years of the Second Intifada, Israel destroyed more than ten percent of Gaza's agricultural land and uprooted over 226,000 Palestinian trees. Most Americans don't know it, but, as of October 2004 (according to a report presented before the U.N. Security Council) the number of Palestinians killed by Israelis since the beginning of the Second Intifada in September 2000 to 2006 was 3,839, including nearly a thousand children, and an estimated 36,433 Palestinians had been injured. During the same time, only 979 Israelis were killed, and 6,297 were wounded. In those four years not only did Palestinians suffer four times as many deaths as Israelis, thousands of Palestinian homes had been destroyed or damaged beyond repair in the Gaza Strip. 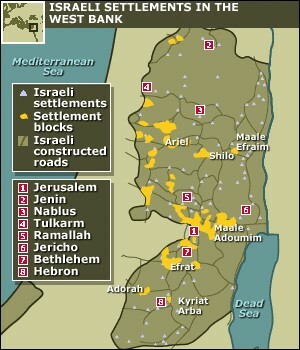 More than 120,000 parcels of Palestinian land had been confiscated for colonial Israeli expansion, "settlement" activities, occupation activities, and the construction of Sharon's imposing Segregation Wall, and hundreds of thousands of Palestinian trees were uprooted in various Israeli military activities. All this happened while America and the rest of the world simply watched and did nothing. Another report by the BBC stated that between September 2000 and January 2005, just in the covert, extrajudicial executions or targeted assassinations, there were 181 Palestinians killed by Israelis, and in the course of those assassinations 288 more Palestinians, including at least 29 children under age 18, were killed "inadvertently." And in the Summer of 2006 the violence and offenses increased again. Another invasion of Lebanon and the destruction of much of its infrastructure caused even more outrage, and the offenses have continued ever since. Adding more fuel to fire have been right-wing American "Christian" Zionists, most of whom are leaders of the Christian Right. One of them has claimed: "Israel was re-born by an act of God and Israel lives! The Jews have suffered great persecution and survived slavery and the [Nazi] Final Solution! God Jehovah will bury Hamas, Hezbollah and Iran! The flag of Israel will fly over the undivided Jerusalem and be the praise of all the earth! It's 1938 again and the new Hitler is Ahmadinejad! Radical Islamicists are threatening to develop nuclear weapons in order to destroy Israel and then the USA! But we are indivisible and we are both here forever!" Right-wing warmongers in the U.S. Congress have even encouraging both the Israeli and American military to drop bombs on Iran, because Iran supports anti-Israeli activism. And that of course encourages proud and militant Israeli hardliners. In America we don’t hear of most of the deaths that have been caused by this insanity, because the American commercial news media ignores most of it. But the whole world became aware of one of the horrible consequence of the insanity in December 2008, when we saw Hamas forces in Gaza killing a few Israelis with mortar and rocket attacks, and then Israel retaliating absurdly and disproportionately with massive fire power, killing hundreds of innocent people in Gaza and causing terror and horrendous destruction. Then the Israeli government invaded Gaza and prevented journalists from showing and telling the world what was happening, because they have indulged in the same war crimes they did when they previously invaded Lebanon, not only causing horribly unnecessary and disproportionate death and destruction. Of course, Hamas's indiscriminate rocket attacks on Israeli civilians were also war crimes, but they do not excuse Israel's far worse war crimes. Testimony by Israel’s own soldiers confirmed what people in the Gaza Strip had charged, that Israel's assault on Gaza perpetrated terrible violations of international law. The evidence reveals that Israel violates international law and its duty to protect the civilian population of the Gaza Strip by: (1) imposing forceful military occupation; (2) using military firepower against a people it is legally bound to protect; (3) imposing collective punishment in the form of a blockade (in violation of Article 33 of the Fourth Geneva Convention) which imposed harmful restrictions on trade and movement and forced families into poverty, children into malnutrition, and denied patients access to medical treatment; (4) deliberately attacking civilian targets, destroying or damaging thousands of houses, mosques, hospitals, factories, schools, a key sewage plant, institutions like the parliament, the main ministries, the central prison and police stations; (5) killing civilians without military justification (according to the United Nations, of 1,434 Palestinians killed in the Gaza invasion, 960 were civilians, including 121 women and 288 children); (6) deliberately employing extremely disproportionate military force; and (7) illegal use of weapons, including illegal white phosphorus. Israeli political and military personnel who planned, ordered or executed these offenses and violations of international law should face criminal prosecution, because if and when we allow any nation to violate it with impunity, respect for international law is diminished, and cruel, arrogant nations are strengthened and enabled. Prominent Israeli journalists were then arrested by Israeli authorities upon re-entering Israel from Gaza. The Israeli government forbid journalists to enter Gaza, because they don’t want Israelis to learn the truth. Rather, the Israeli government and military want to suppress knowledge and publicity of their own indefensible actions, to prevent Israelis from knowing the facts about the impact of the Israeli army’s brutality and cruelty in Gaza, or in the settlements on the West Bank and East Jerusalem. The Israeli government and military go to great lengths to control what Israelis see and hear, and this has been going on for decades. Many reporters have said that the Israelis have succeeded to the extent that the word Palestinian is nearly synonymous with the word terrorist, and any dissent or resistance to Israeli military occupation and expansionism is labeled as irrational, unprovoked, inhuman terrorism. Some say the Israeli goal is to spin the message so that the oppressed are seen as oppressors, culprits are seen as victims, illegal military action and occupation is seen as cultural liberation, aggressive expansion and colonization is seen as righteous reclamation, genocide is seen as self-defense, apartheid is seen as security, and ethnic cleansing is seen as peace-keeping. Of course, some people would dismiss that as a biased, cynical view, but, if we consider the historic facts and the full story, we can see there is some validity to it. On June 16, 2009, former U.S. President Jimmy Carter, a good servant of God, visited Gaza and said that he was almost brought to tears by what he saw. He said that he felt some responsibility because the American International School, one of many destroyed by the Israelis, had been"deliberately destroyed by bombs from F-16s made in my country." Not only that, he added that Palestinians in the Gaza Strip were being treated "more like animals than human beings." The late great Martin Luther King Jr. said: "Darkness cannot drive out darkness; only light can do that. Hate cannot drive out hate; only love can do that. Hate multiplies hate, violence multiplies violence, and toughness multiplies toughness, in a descending spiral of destruction." Granted, there is nothing wrong with there being a State of Israel. But the offenses, intrusions, expansionism, and occupation must stop. The growing number of Israeli settlements in the West Bank and elsewhere should be relinquished and simply given to the Palestinian Authority to house needy Palestinians. That would only be fair, and right. After all, the establishment and expansion of Israeli settlements in the West Bank and East Jerusalem have been described as "having no legal validity" by the United Nations Security Council in resolutions 446, 452, 465 and 471, made under Chapter VI of the United Nations Charter. On October 14, 2014 the British Parliament voted overwhelmingly (274-12) to recognize a Palestinian state, and from the comments made by the members of Parliament (MPs), one theme becomes very clear. The British public has been horrified by what Israel has done to Gaza and its people, and the opinion of the British toward Israel has changed to disgust. An MP used the word “barbarism” to describe the behavior of the Israeli government, another said that the government of Israel has committed “war crimes,” and another described Israeli government policy as “apartheid” – all of which were appropriate. It disappointing, however, that none of the members of the British Parliament used the word “genocide,” because that is what Israeli Zionists have been guilty of for a very long time. It’s good that the British have come to this conclusion, because it was the British who opened the door to Zionist migration from Europe to Palestine in 1917 with the Balfour Declaration, as mentioned earlier in this article. And in that regard it is good that one MP pointed out that the Balfour Declaration declared that “nothing shall be done which may prejudice the civil and religious rights of existing non-Jewish communities in Palestine,” and admitted that the British have not honored that part of the declaration (as was also pointed out earlier in this article). MP Nicholas Soames should be applauded for saying: “Ninety-seven years later, the terms of the Balfour declaration are clearly not upheld with respect to the Palestinians, and in Britain that should weigh very heavily upon us indeed.” And further, Soames said: “What does impede peace is a dismal lack of political will to make the necessary concessions and a tendency in Israel to believe that it will always be sheltered by the United States” ... “Recognition by the United Kingdom would be a strong signal that the patience of the world is not without limit." MP Andy McDonald told members that "My father served with the Army in Palestine from 1945 to 1948 during the currency of the British mandate.” He learned from his father that during that time "There were other terrorist attacks -- on trains and, famously, on the King David hotel. Among the terrorists were Menachem Begin and Yitzhak Shamir, both of whom went on the hold the highest office in the newly formed state of Israel. The point I am making is that committed individuals and groups who pursue self-determination might at one time be deemed to be terrorists but then perceived as freedom fighters and, ultimately, statesmen." MP Andy Slaughter said: "I think that the British people have been on the same sort of the journey as the right hon. Member for Croydon South (Sir Richard Ottaway) described” ... “from being very sympathetic to Israel as a country that was trying to achieve democracy and was embattled, to seeing it now as a bully and a regional superpower. That is not something I say with any pleasure, but since the triumph of military Zionism and the Likud-run Governments we have seen a new barbarism in that country. We have seen it in the Lebanon invasion, in the attack on the Mavi Marmara and the flotilla, and, above all, in the three attacks on Gaza, Operation Protective Edge, Operation Cast Lead ... "
Perhaps now that the British Parliament has acknowledged the truth, the U.S. Government will follow suite and stop bowing to all the powerful American Zionist lobby groups that have fooled and bribed them for so long. After all, U.N. Security Council Resolution 465 stated that the "Fourth Geneva Convention relative to the Protection of Civilian Persons in Time of War of 12 August 1949 is applicable to the Arab territories occupied by Israel since 1967, including Jerusalem." Further, Resolution 465 warns Israel that "all measures taken by Israel to change the physical character, demographic composition, institutional structure or status of the Palestinian and other Arab territories occupied since 1967, including Jerusalem, or any part thereof, have no legal validity and that Israel's policy and practices of settling parts of its population and new immigrants in those territories constitute a flagrant violation of the Fourth Geneva Convention relative to the Protection of Civilian Persons in Time of War and also constitute a serious obstruction to achieving a comprehensive, just and lasting peace in the Middle East." Israel, as an occupying power, is in direct violation of Article III of the Geneva Convention Relative to the Protection of Civilian Persons in Time of War. Article 3(1) states that those who take no active role in hostilities must be treated humanely, without discrimination, regardless of racial, social, religious or economic distinctions. The article prohibits the taking of hostages as well as sentences given without adequate due process of law. And Article 3(2) mandates care for the sick and wounded. Therefore, Israel has not only violated the tenets of Article III but has blatantly demonstrated that it fulfilled the conditions of an aggressor state as defined by Article 51.